Although our regular programme is somewhat reduced during the winter, both Katharine and Mary are running private classes for individuals and small groups. If you you would like to find out more, then please contact us - we would love to hear from you! 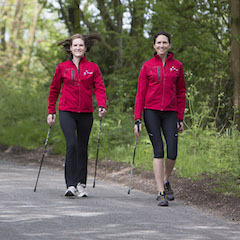 You must have already been taught how to Nordic Walk by a qualified instructor before joining one of these sessions. If you are new to this sport and would like to learn then please click here to read about our beginners workshop. Mary Tweed - April 29, 2019, 9 a.m.
Katharine Green - April 29, 2019, 9:30 a.m.
Mary Tweed - April 29, 2019, 10:15 a.m.
Katharine Green - April 29, 2019, 11 a.m.
Katharine Green - May 1, 2019, 9:30 a.m.
Katharine Green - May 1, 2019, 11 a.m.
Katharine Green - May 2, 2019, 9:15 a.m.
Mary Tweed - May 3, 2019, 9 a.m.
Katharine Green - May 3, 2019, 11 a.m.
Mary Tweed - May 4, 2019, 10:15 a.m.
Mary Tweed - May 5, 2019, 10:15 a.m.
Mary Tweed - May 6, 2019, 9 a.m.
Mary Tweed - May 6, 2019, 10:15 a.m.
Katharine Green - May 6, 2019, 11 a.m.
Katharine Green - May 8, 2019, 9:30 a.m.
Katharine Green - May 8, 2019, 11 a.m.
Katharine Green - May 9, 2019, 9:15 a.m.
Mary Tweed - May 10, 2019, 9 a.m.
Mary Tweed - May 13, 2019, 9 a.m.
Katharine Green - May 13, 2019, 9:30 a.m.
Mary Tweed - May 13, 2019, 10:15 a.m.
Katharine Green - May 13, 2019, 11 a.m.
Katharine Green - May 15, 2019, 9:30 a.m.
Katharine Green - May 15, 2019, 11 a.m.
Katharine Green - May 16, 2019, 9:15 a.m.
Mary Tweed - May 17, 2019, 9 a.m.
Katharine Green - May 18, 2019, 10 a.m.
Katharine Green - May 19, 2019, 10 a.m.
Mary Tweed - May 20, 2019, 9 a.m.
Katharine Green - May 20, 2019, 9:30 a.m.